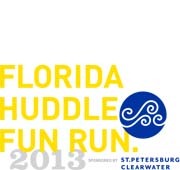 Drawing on the growing popularity of running as a favorite business-world mixer activity, VSPC’s Leisure Sales Department is hosting its first-ever tourism-industry “Fun Run” at this year’s Florida Huddle. VSPC is sponsoring the morning event to coincide with the largest annual gathering of Florida-based hospitality and tourism providers, which takes place Jan. 24-26 in St. Augustine. More than 400 attendees—including some 150 tourism buyers and 30 media from around the world—are expected this year. The 4-mile run, which begins at sunrise on Friday, January 25 and also includes a scaled-down version for walkers, is the brainchild of VSPC Senior Travel Sales Manager Rob Price. “This is a great opportunity to spend time with current and potential business partners in a fun, relaxed setting,” said Price, who has a passion for running. “It gives us a new way to connect with a group of people that are very important to us,” he added. So far, 35 participants—local tourism partners and buyers—have signed up for the event, which awards all participants with a tee-shirt and a medal. This entry was posted in Welcome and tagged clearwater, destination marketing organization, florida, Huddle, st. pete, tourism, travel, visit st. pete/clearwater. Bookmark the permalink.